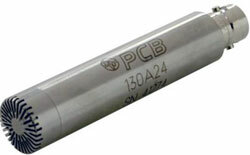 PCB Piezotronics, Inc.: A new 1/2" (12mm) microphone and preamplifier system, model 130A24, is available from PCB Piezotronics, Inc. This array microphone is for use in applications where moisture, oil splash and contamination are a concern. Typical applications include brake and tire noise, industrial machinery noise, environmental noise, leak detection and general purpose acoustic tests. The phase characteristics of this microphone are tailored for noise source location applications such as holography, beamforming, acoustic cameras and sound pressure mapping. PCB Piezotronics is a global manufacturer of microphones, vibration, pressure, force, torque, load, and strain sensors, as well as the pioneer of ICP® technology. This instrumentation is used for test, measurement, monitoring, and control requirements in automotive, aerospace, industrial, R&D, military, educational, commercial, OEM applications, and more. With a customer support team of more than 30 Customer Service Representatives and Application Engineers, PCB proudly stands behind their products with the services you value most, including 24-hour technical support, a global distribution network, a best in class warranty and Total Customer Satisfaction. Our Platinum Products program is one way PCB ensures fast delivery with over 10000 sensors in stock and covered by a Lifetime Warranty. Visit us at www.pcb.com for more details, including our Terms and Conditions.